The rendition (...) under the direction of Jukka-Pekka Saraste seems to entirely match with the composer's vision. (These) important three compositions reveal a personality growing into maturity and of a value very different from any short-term fashion. 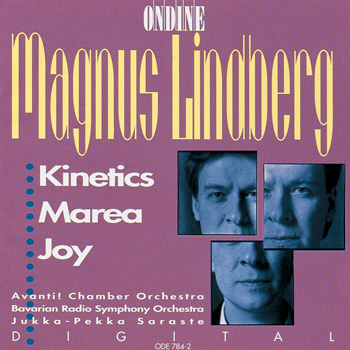 This CD includes three orchestral works by Magnus Lindberg which the composer himself described as a "trilogy": Kinetics (1988-89), Marea ("Tide"; 1989-90) and Joy (1990). They are considered key scores in Lindberg's stylistic evolution during the late 1980s towards a new modernist classicism. Jukka-Pekka Saraste conducts the Bavarian Radio Symphony Orchestra in Kinetics and the Avanti! Chamber Orchestra in the two other works.